I want to do two things. I want to see the Revolution through the eyes of Maximilien de Robespierre, a member of the Committee of Public Safety — arguably, with Saint-Just, its most important member. In a way, Jacobin — he incarnated the French Revolution. In doing so, I also want to talk about the terror and, above all, why it was that people supported or opposed the Revolution. It comes down a great deal to religion, as we’ll see. Maximilien Robespierre was born on May 6, 1758 in Arras, a beautiful town destroyed in World War I in the north of France. His father was a lawyer. He was the son and grandson of lawyers. His father married the daughter of a well-to-do brewer and they were married a few months before the birth of Maximilien. Two daughters, one who died, this is fairly normal, and Augustin, his brother, followed. His mother died giving birth to a fifth child who barely survived her. The father was unstable, always leaving home at the time of the birth of all of his children. He finally died in Germany. Henceforth, if you buy a psychohistorian’s interpretation, “He could only be a man of order. He desperately tried to assimilate himself to the social order. He both loved and hated his father as he adored his dead mother. His whole life was marked by feeling of his father’s guilt, which also represented the death in a real way of his own childhood.” In his last hours, his death wish, his inability to act when he might have saved himself can be seen, if you will, in that context. He was forced into a seriousness and responsibility. He always had a passion for solitude, isolation. He knew what it was to be poor. He was an example of sort of downward mobility. He went to school and he was really smart, supported by charitable foundations, first in Arras and then in Paris. 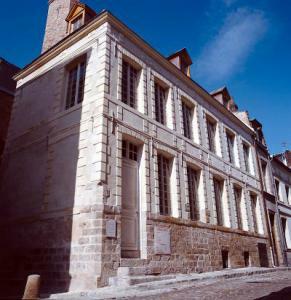 At age eleven to the college or middle school of Louis le Grand, where he became a star classics scholar. He was selected among all the other pupils to read a poem that he had composed to none less than the king and the queen as they passed by Reims, also in the north of France, in champagne country. As it was raining, the king and the queen ordered the driver to go on, not stopping to listen to Robespierre’s little poem and, indeed, splashing his only good suit of clothes with mud as they drove off. At the beginning, but only in the beginning, he did not believe in capital punishment; although, arguably those who agree with him would say that he saved the Revolution by meting out capital punishment. Because of his reputation — this was a classic case of a young lawyer on the make — he’s elected to the Estates General from Artois. He’s unknown. When he goes to Paris he’s called in the minutes sometimes “Robes-Pierre,” sometimes Robespierre. Sometimes Robert, like the name Robert, or sometimes simply Robert, as if that was his first name, and Pierre, his second name. But he began to make a mark, speaking always very softly. Sixty-eight times he spoke in 1789 and he gradually gets his reputation there. He opposes all restrictions on the freedom of the press, and of course that would change later as well. He invokes Rousseau’s concept of the general will to support the view that the king should have no right to oppose or delay legislative measures proposed by the assembly. He sided on the left of the assembly with those who went to Varennes to bring back Louis XVI when he and Marie Antoinette tried to hightail it to the southern Netherlands or, that is, to Belgium. That was the king, by the way. He should have been there first. He supported the idea that all male citizens should have the right to vote and thus, he opposed the idea of having active citizens, who pay taxes, and passive citizens, who did not have enough money to pay taxes and thus could not vote. He calls for, among others, the deposition of — the king’s being deposed, both in the legal sense and being deposed from the monarchy. He was already known as “the incorruptible.” He received letters of admiration. Once leaving the assembly a crowd put oak leaves around him and carried him around the city in triumph. He always wore impeccably white clothes. He wore a powdered wig, which is very much an old regime thing and not a revolutionary thing. He was not somebody who was going to go out and tutoie easily. The revolutionaries tutoient — tutoie is in the familiar form, like du in German, as opposed to Sie. Du is the familiar form. All were equal, therefore, he didn’t say vous to people who were above you in the social ladder. He didn’t like people touching him. Indeed, probably he was chaste. He had only a few flimsy and only by mail flirtations with women. When they picked him up, you have to imagine a sort of crassly American analogy, where a football coach who’s sort of swept off his feet after a big upset or something. He doesn’t like people touching him. He doesn’t like being carried away by them. He was ascetic, always preferred being alone. He ate very modestly. One letter to him said, “As incorruptible as you are courageous,” and he was that, “you have always openly displayed your feelings. It has never been self interest that has made you act or speak, only the general interest.” He identified with ordinary people and he ends up living in western Paris, a more prosperous part of Paris, but in the home of a carpenter on a street called the Faubourg Saint-Honoré. Those were really his happiest moments. It provided him with a family. It had young children in it that he really hadn’t had — a very normal circumstance. People who came to see him saw him sort of stretched out on the couch with his family trying to guess from the way he looked what he might want. Would he want more grapes? Would he want more milk, et cetera? He read a lot. He wrote his speeches, which were written out by hand. He was always well combed and powdered, the cleanest of dressing gowns, et cetera. He began to be a frequenter of the Jacobin Club. 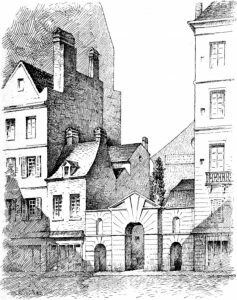 These clubs, like the Feuillants, and the Cordeliers, and the Jacobins, were called that not because they had anything to do with the religious orders, like the Jacobins were a religious order. The biggest places you could meet were churches and abbeys. Those were always the biggest buildings. 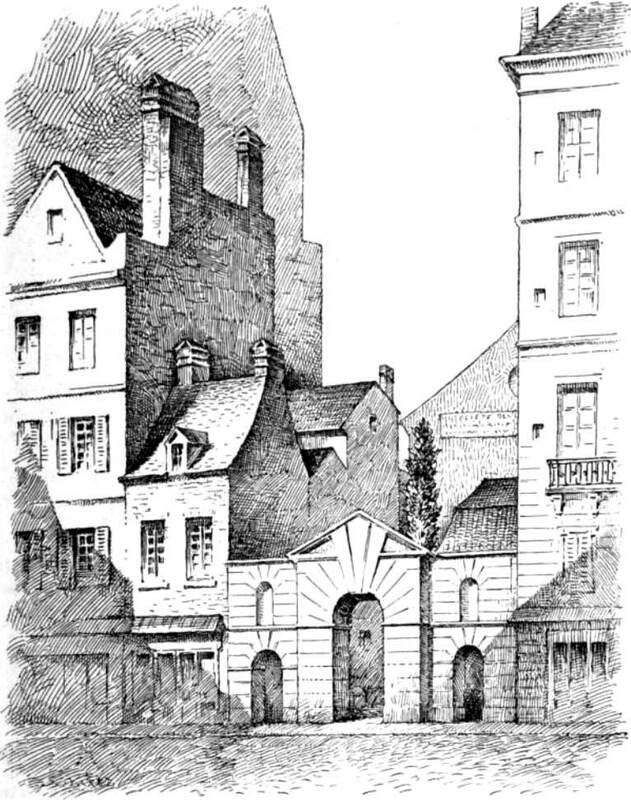 The Jacobins, who were on the left of these clubs, begin meeting right even before the Bastille falls on the 14th of July, 1789. He begins to go to the Jacobin Club. The Jacobin become the great leftwing centralizers of the revolution. They trumpet the authority of the Parisian Sans-Culottes. That’s another French term so important it worked its way into English dictionaries. The Sans-Culottes were those who supported the Revolution. Technically, if you said sans culottes it meant somebody who was not wearing pants. That’s not what it meant. What it meant was not wearing fancy kind of aristocratic breeches, and it became identified with a form of political behavior. You could be an aristocrat, and there were liberal aristocrats, in a meeting in a club called the Club of the Thirty, who helped push the Revolution really toward constitutional monarchy, at least in the beginning. If you were against the Revolution, you were an aristo. You were an aristocrat. If you were for the Revolution, you were part of the people. You chose the color red, because red becomes the color of the leftwing interpretation of the Revolution. You gave people kisses on both sides of the cheeks or three times, depending on where you were in France, as recognizing the solidarity you had as being a citoyen, that is, a male citizen, or a citoyenne, female citizen. The whole idea of kissing, by the way, is terribly important in France, but that’s mostly a late-nineteenth and early-twentieth-century thing. People really kept their distance, whereas now if you live in Paris you kiss twice, or in the Sixteenth Arrondissement not at all; you merely shake hands. If you live in the Parisian suburbs, often you kiss four times. If you live in the south of France, you kiss three times. 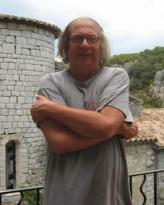 In the Department of the Hérault, which is Bas-Languedoc, if you live in Béziers, you kiss three times. If you live in Montpellier, which is a more aristocratic city traditionally, a more formal city — it was a big university town, it really rocks — you kiss only twice. But this idea of kissing people on the cheeks was a sign of revolutionary solidarity. Symbols were very important. If you carried pikes around, pikes at the Battle of Valmy, which you can read about — is the pikes of the Sans-Culottes that stopped the highly-professional armies of the enemies of the Revolution. So, he believes in the necessity of a single will. Again, this comes out of Rousseau’s idea of the general will to save the revolution against its enemies. He is one of the people that helps push the French Revolution to the left. His principles were totally unshakable. He doesn’t budge on them at all. Of course, it’s just insane to look back and see in Robespierre the origins of totalitarianism, despite the Committee of Public Safety. Robespierre also was a man of his times. He was not against all property. He was against les gros, people having too much unearned property. He thought everybody should have enough to get along, but that even people who didn’t have any property and thus didn’t pay any taxes, as I said before, ought to have the right to vote. He also, like the Jacobins, believed that they ought to have enough to eat. One of the tensions that one found in French Revolutionary political clubs, and political societies, and in the neighborhood sections that began planning how you would defend your neighborhood against foreign invaders or insurgents from within — the price of bread, of course, counted enormously. In a couple of weeks I’m going to talk about what difference bread made in terms of popular protest. People who believed in the kind of free trade that Turgot had in the 1870s believed that the market ought to determine the price of bread. But there was always a tradition that the price of bread ought to be kept at a reasonable amount, so that everybody ought to have enough to eat. So, the Jacobins, most of them believed in the maximum, “the maximum,” which was a maximum on the price of bread. Now, their enemies on the revolutionary left, or left central, were called the Girondins, which I wrote on the board and a name I sent around on the class server. The Girondins, G-I-R-O-N-D-I-N-S — which is also the name of the Bordeaux soccer team — were from Bordeaux and the department of the Girondin, many of them were. They are merchants. They are free trade people and they also were extremely interested in launching foreign wars to carry liberty, fraternity, and equality abroad. I’m scrambling for this great quote. The Girondins were in love with war. There was this great rhetoric about conquest and carrying “freedom” to other countries. Although one had to be, and many people were, cynical about this, when the French troops poured into the Rhineland, the prostitutes of the Rhineland cities dressed up in red, white, and blue flags to welcome their new clients. Robespierre made a series of speeches against this Brissot, who was the former Grub Street writer that I mentioned before, arguing that France should not go to war. He said that — and more about this in a minute — that the danger to the Revolution did not come from a handful of émigrés in Germany, but from within France, from the counter-revolution. That’s important. That’s worth underlining. Secondly, he argued that launching wars all over the place will merely play into the hands of the king, who at this point was still the king, and the counter revolutionaries, perhaps paving the way for some sort of military dictatorship. How forward-looking was that? Because that’s exactly what they ended up with, of course, with Napoleon. Moreover, he argued that war would separate soldiers from the rest of the people. Indeed, thelevée en masse — my guillotine almost fell down — would compromise that, because all citizens become soldiers, et cetera, et cetera. But he said something. This is an amazing little speech that he gave. I’m going to read just a few lines of it. If you think about current politics in this country in the last five years, it may also ring true. 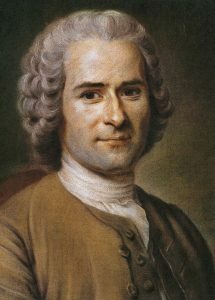 Robespierre said, “The most extravagant idea that can arise in a politician’s head is to believe that it is enough for a people to invade a foreign country to make it adopt their laws and their constitution. No one loves armed missionaries. The declaration of the rights of man is not a beam of sunlight that shines on all men, and it is not a lightening bolt which strikes every throne at the same time. I am far from claiming that a revolution will not eventually influence the fate of the world, but I say that it will not be today.” Amazing! He lost this debate in 1792 and, in fact, his denunciation of plots against the Revolution may have contributed to revolutionary paranoia, which would be acted out in the terror. On the 20th of April, 1792 the Girondins and the king got their wish and war was declared on Austria and French troops crossed into Belgium, that is, the Austria-Netherlands, and the wars went on and on. I want to make a couple points that are pretty important. I’m not going to use these papers to do this. The threat to the Revolution did not come just from Austria, from Great Britain, from Prussia, from Russia, from the big allies. Robespierre got this right. There are two — and the timing of this you can read about in the chapter and please do — main counter-revolutionary threats to the Revolution. The first, which was not the most important but still is worth mentioning was what has been called the federalist revolt. This was based in cities in which merchants, free traders, played a big role in that. You’ve got all these wine merchants and all this fancy land and who merchant other things as well. You’ve got Marseilles. Toulon is not yet the huge port it had become in the nineteenth century. We’ve got Marseilles. You’ve got Lyon, then France’s second city, first in gastronomy, one could still argue today. Varennes was merely where the king is caught. That’s up there. By the way, in 1790, in order to undercut local elites, that is clergy and nobles, and also to impart a more rational organization of the country — it comes right out of the Enlightenment, out of the philosophes — they create départements. They name most of them after rivers, though some are named after mountains. They create a capital in each of them. None of this matters, but it’s just to tell you what’s going on. That’s Haute-Vienne, the capital is Limoges. That’s the Corrèze, the capital is Tulle. Up there is the Creuse, the capital is Guéret. This is Rouen in the Seine-Maritime,. This is the Atlantic Pyrenees, the capital is Pau, et cetera, et cetera. The federalist revolt also in Cannes, that’s where the aforementioned Charlotte Corday came from, from that part. That’s the department of the Calvados, which is also the name of a wonderful apple brandy. The federalist revolt comes in, above all, in Lyon, Cannes, Marseilles, and Toulon. Of course, the revolutionary armies, the armies of ordinary citizens in the republic, what has become the republic, crush them. They crush them like grapes. 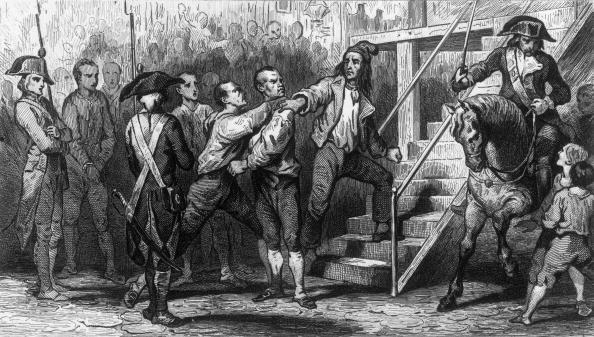 In Lyon, one of the members of the Committee of Public Safety, who was confined to a wheelchair, a man named Couthon, who you can read about, C-O-U-T-H-O-N, says he’s going to plow Lyon under like Carthage; and they do execute people on the Place Bellecour. So, this federalist revolt is against the Jacobins, a Parisian-centered, far-left interpretation of the French Revolution. By the way, there are groups even further to the left. The Jacobins really weren’t that far to the left, but there are groups like The Enraged, les Enragés. There’s even a guy called Gracchus Babeuf, who believed that property should be abolished. These are just very small groups. 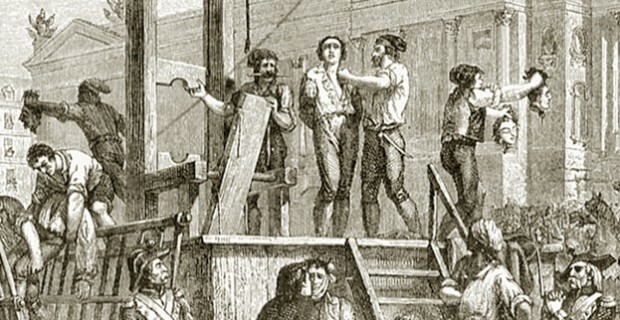 Babeuf is guillotined in Vendôme, which is south of Paris near the Loire. His trial is a wonderful source, the trial of Gracchus Babeuf, an original source. Anyway, that’s the federalist revolt. But the most important threat to the revolution comes from peasants. It comes from peasants in the west of France, also down where we live, in this part of France, too. That comes later. Basically, what I’m going to talk about for a few minutes is the revolt in the west. It was often said that peasants would never march more than a day away from their fields; but certainly, as Mao, or Ho Chi Minh, and lots of other people have shown, that’s not the case at all. The war was fought with a savagery, with a brutality that was simply staggering. There were massacres on both sides. The Vendée, which is in dark there, became a department, good old number eighty-five. But it became such a major blood bath, that the entire counter-revolution in the west is often simply called the Vendée. I am in history literally because I read a long time ago a book written by my late and much-missed friend, Charles Tilley, called The Vendée, which sought to explain, and did explain, and really hasn’t been nuanced very much over the decades, why some people opposed the revolution, taking big-time chances. Other people who didn’t live that far away supported the revolution. What he found — he studied an area, it doesn’t matter where, but sort of the north of that dark area, actually in the Maine-et-Loire, a different department — but here’s another French word that’s also English, in the bocage country. It’s the hedgerow country. He found that the people who rose up against the revolution and took big-time chances — the republicans didn’t screw around, and there was a lot of horrible brutality. They drowned thousands of clergy in the swirling waters of the Loire River, which is a really dangerous river, by putting them out into the river with holes drilled in the bottom of the boat, which didn’t give them a big hope. 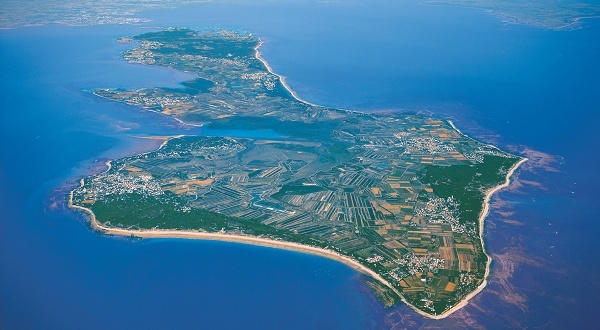 They killed lots of people on the Il de Ré, which is off La Rochelle. Of course, the forces representing the monarchy, representing the nobles, were, if anything, more brutal. They crucified people, literally. They made them kiss the cross before they beat them to death. It was really a nasty time. Looking at people who rebelled and ones who didn’t, one of the things we can say at least about that particular area, but it really rings true, is that areas in which that traditional elite, noble and priest, had not been broken down by the economic and social changes of the eighteenth century. They were physically isolated. These hedges, you see them also in the in the Manche in Normandy. These are huge hedgerows that you literally can’t fight your way through and can’t really climb over. People tended to marry within their village or within a nearby village. The priests still walked tall. The noble was somebody who they still respected, even though many of the nobles had left. Many of them they still had to pay dues to the nobles. Their only contact with this kind of bourgeois world of economic change was with people who were farming taxes, for example, whom they hated, people who were putting out work into the countryside who cheated them and said, “I told you I’d give you five sous last time, but there are a lot of women doing that same work. I’m going to give you three and if you don’t like that, too bad. I’ll walk away and I won’t take the cloth work that you’ve done for me. Too bad for you.” Or people that collected the taxes for the nobles. If you look up further along the Loire River where you had this sort of economic change in the eighteenth century, people accepted this new lead. They were willing to ditch the idea of the monarch. It wasn’t that they all read Rousseau instead of the Bible before they went to bed, but these were big-time changes that reflected the way things had evolved. Let me give you some more examples. One of the most important moments of the French Revolution — and this is also worth remembering, and you can read about it — is the civil constitution of the French clergy. The revolutionaries get the very good idea that you’re broke. We already know that. The monarchy is just flat broke, so where are you going to get the money? Who has money? Well, nobles who leave France have money, because they have a lot of property, particularly in areas like Brittany and in Burgundy and in Ile-de-France, around Paris. But the church has enormous amounts of money, enormous amounts of land. What they do is they essentially nationalize the church, the details you can get, and they force people to take an oath to the French Revolution, to the nation. 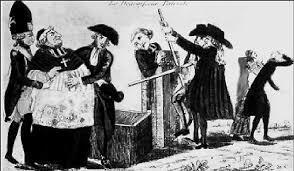 In certain parts of France, particularly those that rose up against the Revolution, the priests don’t take the oath. They refuse to. They are called non-juring, that is, non-swearing, priests. In other parts of France, the priests were more willing to take the oath and they were called juring clergy. This is important. If you just look at this map, you see this is by cantons, cantons within departments. 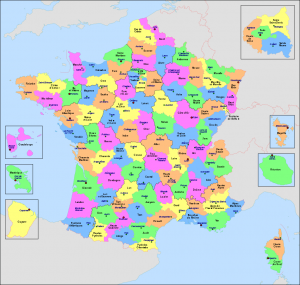 You can see all that white up in Brittany and those revolutionary areas. It corresponds exactly to the area of people who fought against the French Revolution. Because the clergy still has enormous influence, and so do the nobles, even if they’re living in England at the moment, or living in Britain, or living in the Austrian Southern Netherlands, or in the Rhineland or somewhere else in the German states. But this isn’t enough. That’s not enough. We have to see really what — here we go. This is by district. This is an even better map of it. You see that in the central part of France here, priests refused to swear allegiance, as in our village, to the French Revolution. But in Brittany and in Normandy they did, massively. And in Alsace and Lorraine they did, massively. And in the north of France they did, massively. So, okay, that’s fine. That’s interesting. So, what’s going on here? What’s going on? Why does it go like that? It’s not just that people all start getting together and say, “Let’s not swear to the Revolution. Let’s go have a drink of Calvados instead.” More important changes are going on. The word “dechristianization,” which I also sent around, has two meanings. One is the campaign against the church by the revolutionaries to melt down church bells, et cetera, et cetera. Dechristianization, to change the calendar so that it’s no longer January, February, March, but it’s Germinal, Thermidor, Ventôse, names that have to do with winds and plants and the agricultural calendar. That’s part of dechristianization, but that’s not the big issue. The issue is that in these areas in which the Revolution was accepted, that old time religion was on the rope. A friend of mine, who was a great historian, called Michel Vovelle, a long time ago did a book on dechristianization. He looked at part of Provence. He looked at what people did with their money and wills. He looked at the number of people that became priests or nuns. He looked at all sorts of things — how many people baptized their children within the three days you were supposed to in the Catholic Church. What he found is that the church, it wasn’t the Revolution that destroyed the role of the church or that reduced the role in ordinary people’s lives. That had already happened. It began after the counter-reformation, that is, the Catholic reformation. It was already well underway by the 1730s and the 1740s. So, you can see political behavior here reflecting these big-time, important trends. Another way, you could look at bishops’ sermons. You look at how people named their children. In the nineteenth century when they stop naming their children after local saints, for example. That’s another good indication. Or, you don’t have many people named Mary Magdeleine anymore in France, or that kind of thing, or in the Limousin named Marcel or Léonard. These are names of local saints. Here again, the areas that were counter-revolutionary, particularly up in Brittany and Poitou and those regions there, the big story was these major kinds of change. Ultimately, what I’m saying is that religion was very likely to be — arguably the most important cause for people supporting or opposing the Revolution, particularly the radical revolution as the Committee of Public Safety sat around this big table and made big decisions. What about the terror itself? The interpretations of the terror basically have gone like this. One, it was sort of a bloodletting by the very poor of their social betters. Well, that’s pretty much nonsense. Secondly, that it’s a reflex action to save the republic. That makes more sense, basically, and somebody in the 1930s, before there was really quantitative history, went to look. 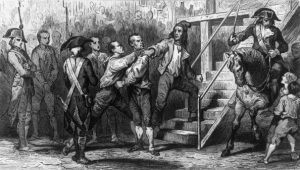 A guy called Donald Greer said, “Let’s look at the victims of the terror.” What he finds fits into where we started, which is Maximilien Robespierre and his attempt to save the Revolution. 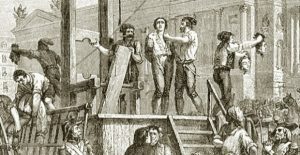 Most people in the terror, there was a higher percentage of clergy and nobles executed, because there were small percentages of clergy and particularly nobles in the French population. But the vast majority of people that either were given a prison sentence, or put their heads through the little window, or were shot down, executed as in Lyon, were peasants and were artisans. Why? Because there were more peasants and artisans, above all peasants, in France than any other social group. That’s good to know that, but even more important, that the incidents of the terror in the French Revolution come in areas that are battle zones. They reflect the war, the professional soldiers of monarchies fighting in the north of France or fighting in the east of France. They reflect the civil war. A lot of people were put to death or executed because they were fighting or participating in supplying troops in battle zones. It’s possible, as my friend David Bell has argued, to say that parts of this represent the first total war. I’ll talk more about that when we get to Napoleon. That’s an interesting subject. Perhaps he thought that his own death would rouse the patriots, that is the Sans-Culottes in the sections, in the neighborhoods of particularly central and eastern Paris. Eleven times he is shouted down, people shouting, “Down with the tyrant.” He says only, “I ask for death.” He leaves with his brother and with Couthon and they go to the town hall, the same building is not there, but it’s in the same spot. They wait upstairs. Occasionally somebody would say to him, “Why don’t we go out and rouse up the sections? We are at great risk here.” And they just sit there. They sit in this room. They sit there all night. Finally, inevitably the troops of the conspiracy run up the stairs. Couthon tries to escape in his wheelchair and the wheelchair bounces along with him down the stairs. Robespierre either takes a pistol and shoots himself in the jaw or is shot in the jaw. He spends time trying to rub the blood, because he had this thing about clean, white clothes. Until they know what to do with him, at one point he’s laying on a table and he points, with Saint-Just, they point to the declaration of the rights of man and of citizen. They said, “We did that.” And indeed, they did. They find themselves taken to the Conciergerie, that is the prison of the Conciergerie, which is still there. It’s no longer a prison. It’s one of the three great gothic halls in France, along with Avignon and Mont Saint-Michel. Of course, the trial is, as he would have had it for the enemies of the Revolution, is quick with no defense really permitted. The next morning they clip his hair back, as one did, so that the long hair would not in any way slow the blade of the guillotine. They take him, put him in a wagon, and it takes, because there were not major thoroughfares through Paris. They take him to the Place de la Revolution, which is now called the Place la Concorde and they pass him by his house, the house of the carpenters where he stayed, where he had his happiest moments. As he gets closer to the Place de la Revolution, where he’s going to meet Sanson — the executioners are all — it’s a blood trade, after all. Rather like butchers, they all intermarry. They lived outside the walls of cities. He’s going to meet Sanson. As he gets there, he surely noticed that the women were more and more well-dressed and so were the men. As he gets there, they’re shrieking at him obscene terms, “Down with the maximum,” the maximum on the price of bread. It’s a very different crowd. Thousands of people came to hear, to lean forward to catch the last words, to see the head held above, as they did with Louis XVI and with Marie Antoinette. “Hold my head up. 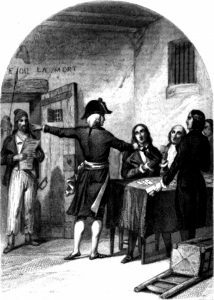 It’s a good one,” said Danton — or something like that, when they’d executed him on Saint-Just and Robespierre’s orders before. He meets Sanson with blood pouring out of the bandage holding his jaw and having come loose. Even at the end, even as they shove his head into the little window, blood is pouring from him. One doesn’t know — we can’t imagine as he looked up as his head is down. He looks up and he sees the throngs who have paid a fine price to sit on the roofs, like living across from Wrigley Field or something like that, to see the death of the tyrant-tyrant, or the person who saved the Revolution, or one of them. It’s very hard to say. It depends on your view. 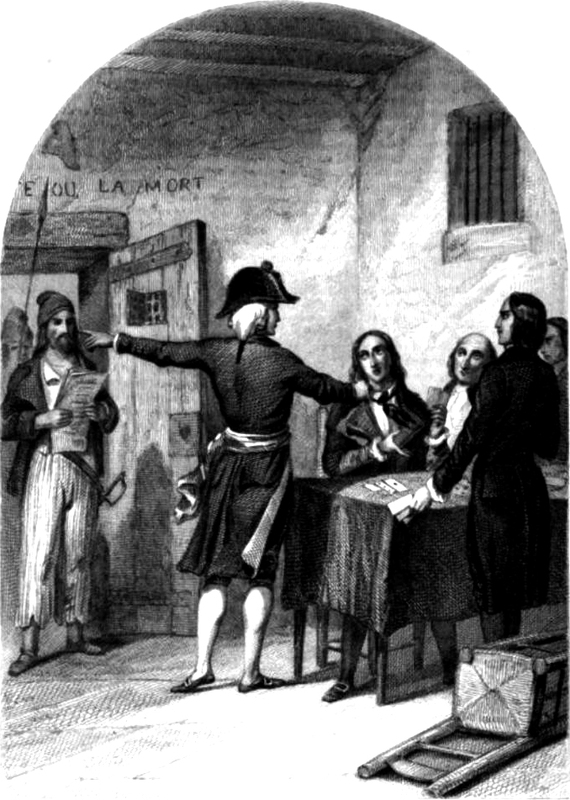 But certainly, one can imagine that Robespierre breathed a breath of relaxation, of leaving an existence that had tortured him and of gaining for the Revolution — he hoped — revolutionary immortality, but also perhaps, one can argue, paying a debt, a debt to his family that stemmed from the death of his own mother long before in Arras.